Yoga is a scientific system of physical and mental practices that originated in India more than three thousand years ago. Its purpose is to help each one of us achieve our highest potential and to experience enduring health and happiness. With Yoga, we can extend our healthy, productive years far beyond the accepted norm and, at the same time, improve the quality of our lives. Krishnamacharya, the father of modern yoga, emphasized Vinyasa as an artful approach to living, a way of applying the skill and awareness of yoga to all the rhythms and sequences of live, including self-care, relationships, work, and personal evolution. In essence, Vinyasa can be considered the yogic art of conscious evolution.Vinyasa Flow links the postures practiced in a regular Hatha class into a sequence of movements that "flow" with the breath in a more vigorous series. Vinyasa Flow involves moving from one posture to another with very little rest in between and creates a strong cardiovascular workout. 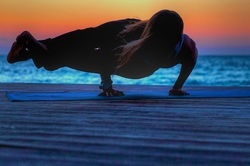 Variations on the Sun Salutation are often used as a warm-up, followed by a standing sequence, balancing poses, and then seated poses. As in all Hatha classes, relaxation (savasana) ends the class. Vinyasa Flow is recommended for students who have practiced Hatha Yoga and are interested in exploring a more movement-oriented class. Vinyasa Flow builds strength, endurance, and a strong focus. The classroom is not heated, but the physical practice will naturally build heat in the body. One to one (up to as many as 4 people) time with personalized enhancements and assists to allow the student(s) to deepen and strengthen in specific areas of interests. For more Information please Contact Yvonne directly.